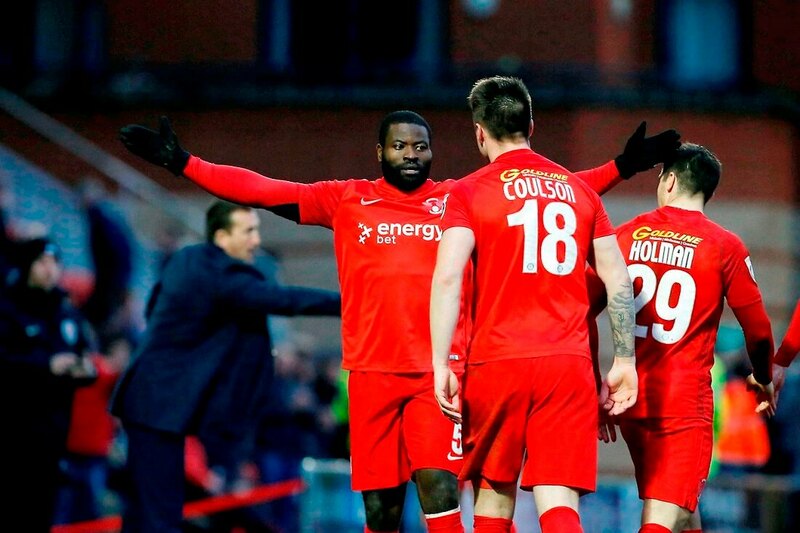 Leyton Orient lost at Brisbane Road 3-2 to promotion chasing Aldershot despite taking a first minute lead in an enthralling encounter in East London. There were chances galore for both teams and the O’s will be disappointed not to get anything out of the game especially when they went a goal up after just 15 seconds of a defeat that sees the teams below them start to concertina. After a fantastic honeymoon period for manager Justin Edinburgh, the last couple of games have been a little rough for Leyton Orient and Solihull Motors surprise 3-1 away win at Dagenham and Redbridge means the O’s are only a tantalising two points above the relegation zone. Yet Orient were off to an absolute flyer needed only 15 seconds to take the lead as Jobi McAnuff slipped the ball through to Macauley Bonne, who placed it between the goalkeeper’s legs and into an empty net. Despite this early setback The Shots responded relatively well to such early adversity, however The O’s dominated for long spells in the first-half. Will Evans blocked efforts from Bonne and McAnuff. Ward then had to hold on to McAnuff’s angled shot despite Bonne’s presence in the six-yard-box, but steadily the visitors grew into the game. Kinsella and McQuoid combined well to set-up McDonnell, whose shot was charged down, and McQuoid himself also had a shot blocked. However, Ward had to make a fine save to stop Holman’s angled drive, and Bonne then sliced his shot wide from seven yards, as Orient threatened to extend their lead which would have ensured great confidence going in to the changing rooms. Instead Aldershot levelled a minute before the break, with Shamir Fenelon diverting the ball past Dean Brill when played through to give the half-time team talks a different complexion. A crowd of 5,728 witnessed a lively start to the second half as the Hampshire team forged ahead with the second period just two minutes old when Adam McDonnell’s shot hit the crossbar and bounced down, and before anyone could decide if it had crossed the line or not, Will Evans headed home to make sure and put the decision beyond any doubt. Orient responded well and Dan Holman won another corner for the hosts on 53 minutes. The driven left wing delivery was met by George Elokobi, whose falling volley from five yards flew past Ward to send the home fans into raptures. Half chances continued to flow as the game ebbed and flowed towards either penalty area, but it was finally won by Aldershot on 76 minutes. Rendell’s cross field pass was superbly controlled by Kinsella on the left and his touch inside allowed McDonnell to evade a challenge and shoot low from 22 yards. Goalkeeper Dean Brill seemed to have it covered until the ball squirmed underneath him and into the net. Aldershot protected their lead superbly, including an 83rd minute goalmouth scramble which seemed to last an eternity. Brill clutched Fenelon’s shot but the final opportunity fell to former Shots striker Holman in the fourth minute of stoppage time. A long high ball was flicked on and, from the edge of the penalty area, Holman spun in an instant but the shot flew over the bar. Almost immediately the boisterous celebrations in the packed away end signalled a potentially pivotal victory as the home fans saw their team slide perilously close to the bottom four of the National League. The Shots cut the gap at the top of the National League to a point as Macclesfield were held at home by lowly Torquay. Meanwhile for the O’s life is not quite as rosy as a month ago as Barrow one place below them have a game in hand following their game against Sutton United postponed due to a waterlogged pitch. Chester and Guiseley were both defeated while as mentioned bottom team Torquay picked up a draw and Solihull a priceless victory. Plenty of guile, team spirit and strength is required to ensure the O’s get back to winning ways and stay in the National League. Now might be the perfect time to have a flutter on the O’s so if you fancy a bet on Leyton Orient then why not checkout this link.